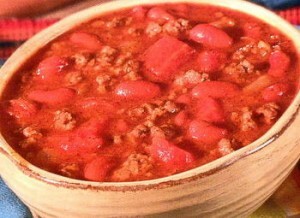 It’s that time of year when chilly temperatures have me thinking chili. I especially like how easy and convenient this recipe is. I just put it all together in the morning and when dinner time rolls around my family enjoys a delicious hot meal in minutes! 1. In a large skillet over medium-high heat, cook the ground beef, stirring often to separate the meat, until well browned. Using a slotted spoon, transfer meat to a 3-1/2-quart slow cooker. 2. Add the remaining ingredients to the meat in the slow cooker; stir. Cover and cook on Low for 8 to 10 hours or on High for 4 to 5 hours. Makes 6 servings. * If your family (like mine) doesn’t like kidney beans just substitute 2 cans pinto beans in place of the kidney beans. ** Serve with hot cornbread muffins for an even heartier meal!